Note: This article was written prior to week 4 of the 2014 NFL season, so keep that in mind while reading. 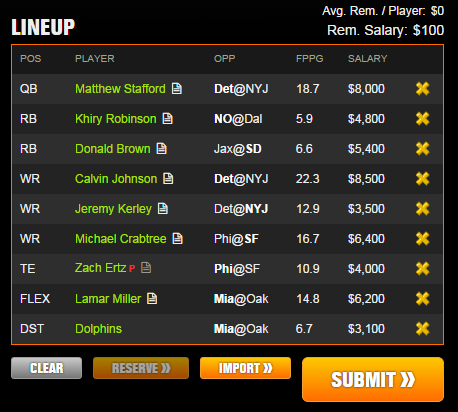 Roughly 2 weeks from now, DraftKings will run their highly anticipated Millionaire Maker Fantasy Football tournament. 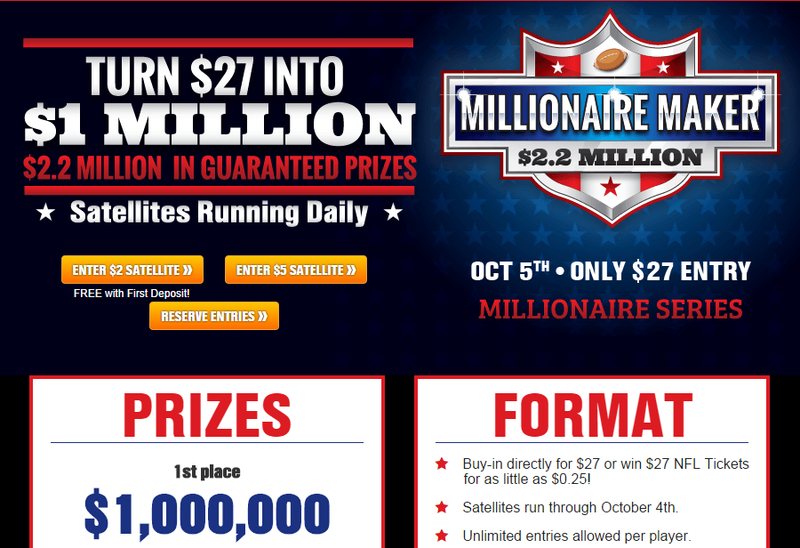 The Millionaire Maker is a $27 to enter, $2.2 million dollar fantasy tournament with a 1st prize of one million dollars, one of the biggest prizes ever awarded in a fantasy tournament, and certainly the biggest prize in a tournament with a buyin so small. 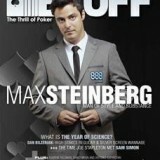 I will personally be putting in over 100 different lineups in the Millionaire Maker in an effort to win that top prize. As you can see, while 1st place is $1,000,000 as advertised, 2nd prize is only $100,000, and 3rd is only $50,000.This discrepancy is totally ridiculous, but clearly this was the only way DraftKings could support a $27 tournament with such a high 1st prize. While it’s fun to sit there and simply laugh at this massive difference, this factor is something to think about as it completely changes how you should set your lineup in the Millionaire Maker. Since almost half the prize pool is given to 1st place, we need to maximize our chances of getting 1st at the expense of of placing in the middle. But the question is, how do we do this? One way to help our cause is using correlations. a) Quarterback and WR. I explained this in the above paragraph. You absolutely should be pairing your QB pick with a WR on his team. b) Defense and Running Back. In general, if a running back’s defense is doing well, he should get more oppourtunities since teams tend to run more often when they have a big lead. He should also get better field position which will lead to TD oppourtunities. c) Receivers on opposing teams. When one team is scoring a lot of points, the other has to play catch-up, which almost always means more passing, shorter drives, and higher scoring games. Using players in the same game, but on opposite teams, can ensure that you’ll either have 2 duds at WR, or 2 fantastic games, which is good because we do not want any mediocre performances. a) Defense and opposing RB. This one is quite obvious as well, you absolutely do not want to use any player from a team your defense is facing, since his production will take away from your defense’s points and vice versa. For RB, it’s even worse because teams that haven’t scored usually will abandon the running game. b) Skill players on the same team (WR/RB/TE). If a WR, RB or TE touches the ball, it means that a WR, RB, or TE is NOT touching the ball. While sometimes there’s enough offense to go around and two players can have big games on the same team, it’s unlikely. It’s possible someone will win the Millionaire Maker using two skill players from the same team, but to maximize your chances, you should not be doing this. c) RBs on opposing teams. You almost never see two RBs in the same game have great games and it’s for several reasons. Running kills the clock which gives the opposing team less oppourtunies and as I stated before RB performance is correlated with big leads. The only exception to this is RBs like Reggie Bush and Giovani Bernard, who are mostly pass catchers, since being down actually helps these RBs get more touches and better opportunities. d) D/ST and QB. If a D/ST is doing well (which hopefully means some pick-6’s, fumble returns for a TD, or special teams TDs), the Quarterback is going to get less opportunities on offense and there will be less of a need to throw. This lineup has the makings of a great lineup, we have a QB/WR combo in Johnson and Stafford who both have very high upside, and we have a WR on the opposing team in Kerley, who’s a deep play threat. But there are a few reverse correlations on this team. A good performance from Khiry Robinson will take away from Graham’s TD and catch opportunities. And Golden Tate almost certainly will not have a great game if Calvin Johnson lights it up like we need him to. 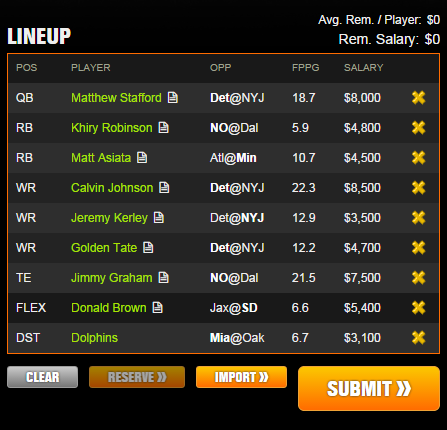 By making a few slight changes, we can make a lineup with a much better chance of winning. We replace Jimmy Graham with Zach Ertz, who doesn’t have the upside of Graham but is capable of a big game. This gives us more money to spend and we use it wisely pairing Lamar Miller with the Dolphins D, two pieces that are highly correlated. We also replace Tate with Crabtree, and now we have two high upside receivers from the same game but on opposite teams. Our lineup is littered with correlations and we’re primed for a boom or bust day on DraftKings. 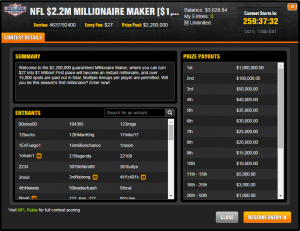 DraftKings is holding the Millionaire Maker every week! Deposit now and receive a bonus on your first deposit! Just click through this link and you’ll be on your way to becoming a millionaire! While focusing on correlations may take away from the overall value of our team, our goal for DraftKings Millionaire Maker is to have a huge hit, and we don’t care about a huge miss. It’s a million dollars or bust boys and girls, good luck.